You are here: Home / Prayer / Are Your Prayers More Than Just Your Wish List? Are Your Prayers More Than Just Your Wish List? Have you started your Christmas list yet? Barely into the new year and my kids have already started theirs. Even though they’re still enjoying the newness of gifts from this past Christmas, they’re beginning to collect ideas for Santa’s next visit. As I remind them that Christmas isn’t just about making a list of things we want, I think how often we approach prayer as a Christmas wish list. God is more than our fairy godmother, more than Santa. He’s our Creator and Savior. He wants to enter into personal relationship with us. To love us and be loved back. To have us trust and rely on Him. To have us live lives that glorify Him. In return, He may bestow blessings upon us and answer our prayers, but first He wants our hearts. Do you find yourself approaching many of your prayers with a list of requests? Listen to your prayers and see if you hear more “I want to ask You, Lord” or more “I want to be with You, Lord.” Are you building that relationship with God through your prayers? We all have our list of prayer requests – for ourselves and for others – and I don’t want to imply we shouldn’t bring those before God. I simply want to suggest we also need to spend time just “being” with God and developing that relationship. Make sure you’re spending prayer time on other conversation topics, too. Prayer is our conversation with God. For as many topics as you might discuss with your best friend, you can have those same kinds of discussions in prayer with God. Below are 8 critical conversation topics to include in your prayers. You might not include all of these in each conversation, but do strive for a balance so you don’t neglect any entirely. We should praise him (like giving compliments to your friend) and, in doing so, remind ourselves why He is so amazing. Sometimes we need to take time to call out what is so wonderful about someone and why we are such good friends, so we don’t take the relationship for granted. We should do it with friends and we should do it with God. When a friend gives you something or does something nice, you say “thank you.” So we should also thank God for all that He does in our lives. We’ve all done or said something hurtful to our best friend, even it if it wasn’t intentional. In order to repair and retain the friendship, we have to apologize – and do so sincerely. Similarly, we sin every day, which is hurtful to God. We must take time to apologize and repent of these sins as part of our prayers with God. This might be one of the main topics of conversations between friends – what should I wear, where should I go on vacation, what should I do about this problem at work, how do I help my child through this struggle, and on and on. God is the ultimate guide for our lives, so we should ask His opinion. Only, God doesn’t just want to be consulted, He wants us to obey and follow. I’ll tell you, though, God’s guidance (when you obey) is better than any you’ll get from a friend. He will lead you to His better future for your life. God does want to hear our prayer requests. Bring the needs of others to God and ask Him for help. Bring your own needs to God and lay them at His feet. Even when you don’t have the words to express your prayer needs, lean on the Holy Spirit to intercede for you. God knows your heart and your needs and will hear your prayers when spending time with Him. If only one person does all the talking, it’s a lecture, not a conversation. So, be sure you give God a chance to respond. Allow silence and listening in your prayers to let Him enter the conversation. PRAY DEEP CHALLENGE: Which of these prayer topics do you least include in your prayer time? Spend time in prayer today covering just that topic. Then, allow silence in your prayer to let God enter the conversation. This post is part of the “Pray Deep” series. For more information on the series, click HERE. Such a beautiful post! So often I have stopped praying before giving God the space and time and opportunity He needed to talk back to me. I have missed SO much by rushing through prayer time! I am finally learning that the part where He speaks is certainly the most important part of our communion…Him pouring out His heart into mine! As the song says, “Oh, what fellowship! Oh, what joy divine! Leaning on the everlasting arms!” A few months ago, I started keeping a pen and notebook paper near me when I am praying. As God begins to speak, I write down His words to me. They are so precious! Sometimes, His words are flowing so quickly, I have to write fast to keep up. Later, I have gone back so many times and re-read those precious messages! They have comforted me more than I could ever express. God bless you in a special way….and I can’t thank you enough for your prayers for my dear sister and our family at this time. It was so nice to see your sweet comments on my blog. I love the listening part of prayer, too! 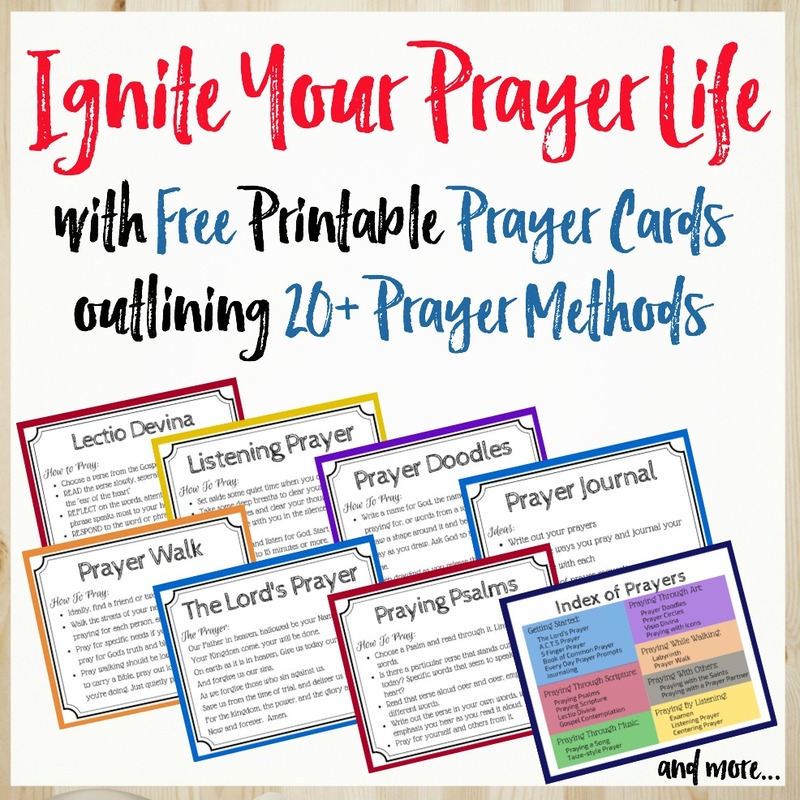 For so long I thought prayer was for us to run through our list and be done, but once I discovered the listening part it transformed my prayers and my relationship with God. Stay strong and keep praying! I love to just “be” with God because I have found that in the quiet I am more able to hear His voice, take time for thanks and praise and learn what He has planned for me. Thank you heeding God’s call and writing this beautiful series on prayer. Have a blessed week. Thanks, Mary! One of the most powerful moments I’ve experienced was taking a group of 100 women through 3 minutes of silent prayer. I had the privilege of watching from the stage and was blown away at the faces as they experienced just ‘being’ with God. Kathryn, I LOVE this. It is true in my prayers life. Sometimes I just pray without paying attention let alone to listen to Him. After reading this , I promise myself to follow the steps that you mentioned till it becomes a routine to my prayers life and God sees the desire of my heart and I ask Him to help me. Thank you. Mimi – So glad this one spoke to you. One of the things that has transformed my prayer life was to stop asking for things in my prayers and instead to just ‘be’ with God, to praise Him and pray His words. As I’ve done that, I’ve grown closer to Him and begun to hear Him more clearly. I’d encourage you to try some of the prayer methods that focus on listening to God – through silence or through scripture. Thanks, Tai! Always a blessing to hear from you! What a wonderful way to think about what we pray for. Good food for thought there! Thank you for sharing these insights Kathryn! Thanks, Ruth! Glad you stopped by! So beautiful! And I love how you split up praise and giving thanks. I know those are different, but it’s hard for me to grasp how sometimes. I appreciated your further clarification! I think the maturity of prayer life and the deepening of that awesome, personal relationship with Jesus starts when we move from lists to the things you suggest here. Thanks for your words. Blessings! Praise is one I still struggle with sometimes. With so much on my mind to discuss with God, it’s hard to step back and take the time to praise Him. Yet, I’ve found it sets my heart in the right place to remind myself who He really is. I often use the names of God (depending on what conversation I need to have with Him) and it puts me in the right place of reverence. Thank you! Glad you stopped by and glad this spoke to you! I love Kathryn how you provide really practical ways on how to pray. You make it relatable to real life. There is power in this. Thank you for this! I cheer on your prayer words today from the #RaRalinkup on Purposeful Faith. Thanks, Kelly! Love #RaRaLinkup and all the encouragement in this community! I certainly struggle with just being with God. That whole silence thing gets me and I try to fill up the space. How can He get a word in when I am like that though? Great post! Silence can be hard – and I’m an introvert who loves alone time! I think it’s hard to set aside all the things clamoring for our attention – and so many expectations of what we’ll experience in the silence. I’ve found some of these prayer techniques to be helpful in spending that silent listening time with God. Several of the ones I’ll be writing about in this series are focused on just being with God – and there’s power in that! Blessings to you! Kathryn, I love this post, along with all the other posts on your wonderful website…so deep, so rich, so compelling… I have printed your Pray Deep printable prayer cards on cardstock and will enjoy the many varieties of prayer that they suggest…so creative…thank you, again for stopping by this morning and leaving such an encouraging comment on my “Lamb of God” post. Many blessings to you! Yes. Just spending time with the Lord is the most valuable thing we can do. If he chooses to honor our requests as well, that is icing on the cake. We certainly wouldn’t want our personal relationships with others to only be requests. Good thoughts here! It’s a small thing, but so critical in our relationship with God – just take some time to “just be” and listen. Can change the game! Love this post 🙂 Visiting from FaithBarista. Something I learned about prayer after 30 years of “praying” was from our 3 year old who mistakenly switched up some words that my husband always used in prayer over dinner. The switch up was ordained by God because in that, it rocked the core of my prayer life. He would say “Lord, thank you for our needs.” Wow! A 3-year olds understanding of God is thanking Him for making us dependent on his provision. Amazing 🙂 Thanks for your beautiful post. Prayer is an awesome and powerful gift we’re given. Out of the mouths of babes… Love how God speaks to us through our children 🙂 So glad you stopped by! Good reminder. Prayer is much more than a list we bring. It’s more than words we speak or something we cross off our spiritual to do list. How can we have a relationship with someone if we don’t take time to listen and seek out their company regularly? In this too rushed life I need this reminder often. Thanks for posting. so glad you visited today – and glad to find your site, too! Hi, Kathryn, I’m stopping by from Grace and Truth. 🙂 It seems that when I’m willing to spend more time in prayer, it becomes less about the list and more about conversation. What’s really great is when that conversation carries on throughout the day! Thanks for sharing with us!